While meeting on a train, Guy Haines, a young tennis player, and Charles Bruno, a charming psychopath. Charles wants to "get rid" of his hated father, and Guy the similar to his ex-wife. They drink, toast and decide to exchange murders, meaning that neither of them will be caught, as they have no motives. Being Patricia Highsmith's first piece of published work, Strangers on a Train highlights the alienation in postwar America. 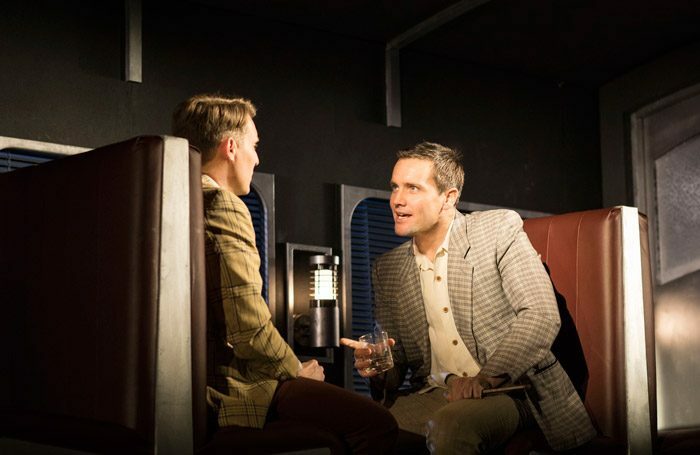 A clever set that hosts multiple rooms, a staircase and most importantly, the train, designed by David Woodhead. Projection (designed by Duncan McLean) is used to create the house and transport the audience to the crime scene. Charles Bruno’s aimless and lonely, whiskey-filled life is wonderfully acted by Chris Harper. As Charles' life turmoils into a negative and tragic end, Harper wonderfully creates the perfect madman and criminal with no conscience or awareness of what he's doing. Helen Anderson's performance as Elsie Bruno is crucial and it is magnificent. She is not, as she is in the novel, seen as the gold-digging wife. A crowd-silencing performance at the end of the show, where she abandons her son. Elements of physical theatre are used, directed by Anthony Banks, that recreate key moments in the past, like the murder of Guy's ex-wife. These moments could have been developed, as they were over before you even realized what was going on. A thrilling piece of theatre that sent chills throughout the audience. A must see.